You can pick up you bib on Friday from 12pm – 8pm at The Pike, or on Saturday from 6:00am – 7:30am next to the Start Line. To pick up your bib, you must show a form of ID and sign a physical waiver, even if you already signed one online upon registration. We will have waivers on-site, or you can print here, sign at home, and bring with you. If you wish to pick up bibs for others, (including friends, family, or teammates) you must both show a copy of their ID and bring a hard copy of their waiver. There are two options when registering for the Tour of Long Beach. We wanted to offer those that were dedicated to raising support for the patients and families being treated at Jonathan Jaques Children’s Cancer Center at Miller Children’s & Women’s Hospital Long Beach a discounted registration in appreciation for their hard work. *With this option, you agree to fundraise a minimum of $100 for Miller Children’s and in exchange only have to pay $30 to participate in any of the rides!! You will be prompted to create a fundraising page on Crowdrise.com upon registration. If you do not reach your $100 minimum on Crowdrise by 11:59pm on May 9, 2018, your credit card will be charged the balance. *With this option, you agree to fundraise a minimum of $100 for Miller Children’s and in exchange only have to pay $35 to participate in any of the rides!! You will be prompted to create a fundraising page on Crowdrise.com upon registration. If you do not reach your $100 minimum on Crowdrise by 11:59pm on May 9, 2018, your credit card will be charged the balance. *With this option, you agree to fundraise a minimum of $100 for Miller Children’s and in exchange only have to pay $40 to participate in any of the rides!! You will be prompted to create a fundraising page on Crowdrise.com upon registration. If you do not reach your $100 minimum on Crowdrise by 11:59pm on May 9, 2018, your credit card will be charged the balance. This is a charity ride and we appreciate your support through fundraising. Fundraising is only mandatory if you chose the “Discount Price with Fundraising Minimum” registration option, though we do encourage everyone to try and fundraise to support those patients being treated at Jonathan Jaques Children’s Cancer Center at Miller Children’s & Women’s Hospital Long Beach. Is there a minimum donation required? A donation is no required, but remember, the best way to show you are invested in this cause is to make a donation yourself. The Tour of Long Beach (Cruz Gran Fondo, Metric Century, Tour of Long Beach and Family Ride) starts on Shoreline Drive and Linden Avenue. All events finish at the Marina Green Park off of Shoreline Drive. 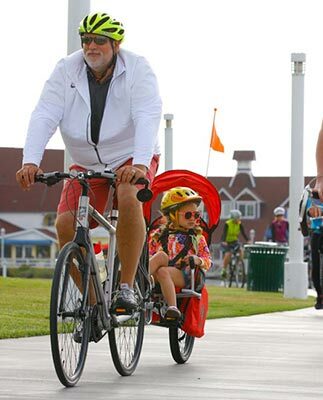 Participants will be directed from the beach bike trail for medals, water & food, and into the Finish Line Festival. Are there any aid stations along the course? A total of three aid stations are available to riders along the 30-mile course and a total of 5 along the 62-mile course. There are two additional aid stations for the Cruz Gran Fondo ride. Stations will be stocked with water, electrolyte drinks, assorted fruit, cookies and granola bars. Please feel free to supplement with your own nutrition. Medical personnel will be available at every aid station and bike mechanics will also be available at most aid stations. We HIGHLY ENCOURAGE you to bring your own flat repair kit as delays in assistance may occur depending on the volume of repairs requested. If there is a medical emergency and the rider is seriously hurt out on the course, please do not hesitate to call 9-1-1. Helmets are mandatory for the Tour of Long Beach. JAX Bicycles will have a booth at the Start Line and will be selling helmets prior to the ride for those who forget or need one. No, this is not a timed race. Participants in the 100-mile Gran Fondo must reach rest stop #5 at El Moro Elementary School (Mile 71.9) no later than 2:15 pm. The Finish Line Festival will close at 5:00pm sharp (beer garden closes at 4:00pm). Those that arrive at rest stop #5 after 2:15 pm can either take a SAG truck ride back to the Finish Line or have the option of riding without SAG support and knowing that the Finish Line will be closed. No racing - routes are not closed courses. Safety is our primary concern. All riders should ride in a courteous and safe manner following the rules of the road. How will the route be marked? There will be signage throughout the route and at every turn. Please keep a copy of the turn-by-turn directions for your specific ride with you and/or download the route prior to the event in Strava so there is no chance of getting lost. Are there any types of bikes that are not allowed? Will I be able to rent a bike at the event? The Tour of Long Beach has partnered with Long Beach Bike Share to provide bike rentals to participants. Must register prior to the event. More Information to follow. Is there a photographer for the event? There will be several photographers on the route throughout Long Beach – so smile! Photos will be available for purchase online the week after the event. What time does registration and bib number pick-up close? On Friday, May 11, from12pm – 8pm. and Saturday, May 12, from 6am - 7:30 am. There will be on-site registration during these times as well, but we cannot guarantee that there will be space for those looking to register the day-of or that they will be able to receive a t-shirt. All participants will receive a bib number which must be placed on the front of your jersey or shirt and stay there for the entire ride. This bib number will help you find photos of yourself after the ride and will also allow you to receive a finisher's medal. If I am unable to ride, can I get a refund? As this is a charity event raising money for pediatric cancer research, we are not able to refund your registration. Who benefits from the money raised in the Tour of Long Beach? All support raised through fundraising and sponsorships by both individual riders and groups benefit pediatric cancer programs at Miller Children's & Women's Hospital Long Beach.